This impressive and unusual memorial in Anfield Cemetery bears a touching picture of Iorwerth Ap Owen on the side and was erected in his memory by his parents after his death on May 7th 1917. 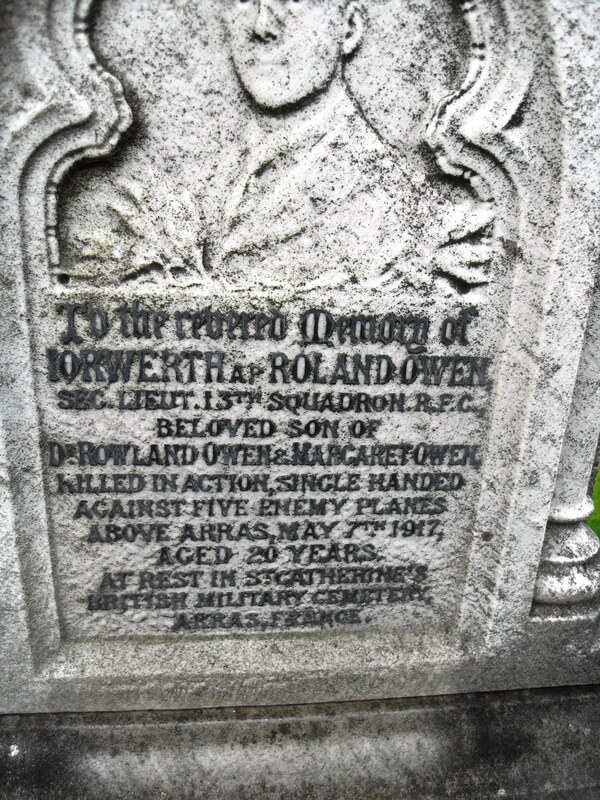 Iorwerth Ap Roland Owen was born on July 22nd 1896 to Dr Roland and Mrs Margaret Owen. His father hailed from Anglesey, but the family lived in Seaforth. Iorwerth began his military career at Mill Hill School, joining the Officer Training Corps. He matriculated at London University in 1915 intending to become a doctor, but put his studies on hold to join the Inns of Court OTC. He pursued a boyhood interest in aviation by applying for a commission in the Royal Flying Corps and transferring to 17th Squadron at Croydon, received his ‘wings’ just six months into training in 1917. Ten days later, Owen was sent to France. He died within the month. Second Lieutenant Owen and his observer AMII (Air Mechanic Class II) Reginald Hickling set out from Savy aerodrome at around 10:40am on 7th May 1917 on a photographic reconnaissance mission. Within the hour, they were flying above Arras when their plane was set upon by five enemy planes. By all accounts, Hickling died instantly; while Owen, shot in the head and chest, remained conscious enough to land his plane without accident, a skill he had been particularly proud of during training. He died soon after in a field ambulance without ever regaining consciousness and was buried in St Catherine’s British Military Cemetery, Arras. Ironically, the German pilot credited with the kill, Lieutenant Karl Allmenröder, had also been destined for a career in medicine before war broke out. In Allmenröder’s highly successful but brief career, Owen’s was the tenth of 30 planes he shot down before his own death on 26 June 1917. He was aged just 21 at the time. George Edward Nurse (14 April 1873 – 25 November 1945) was born in Enniskillen, County Fermanagh, Ireland but grew up in Guernsey where his father was a hotel keeper. Aged 18, he signed up with the Royal Artillery at Woolwich, having previously served in the Guernsey Militia. Promoted to Corporal, he was recalled for army service in 1899 as the Second Boer War broke out. George won his Victoria Cross aged 26 at the Battle of Colenso on 15 December 1899. 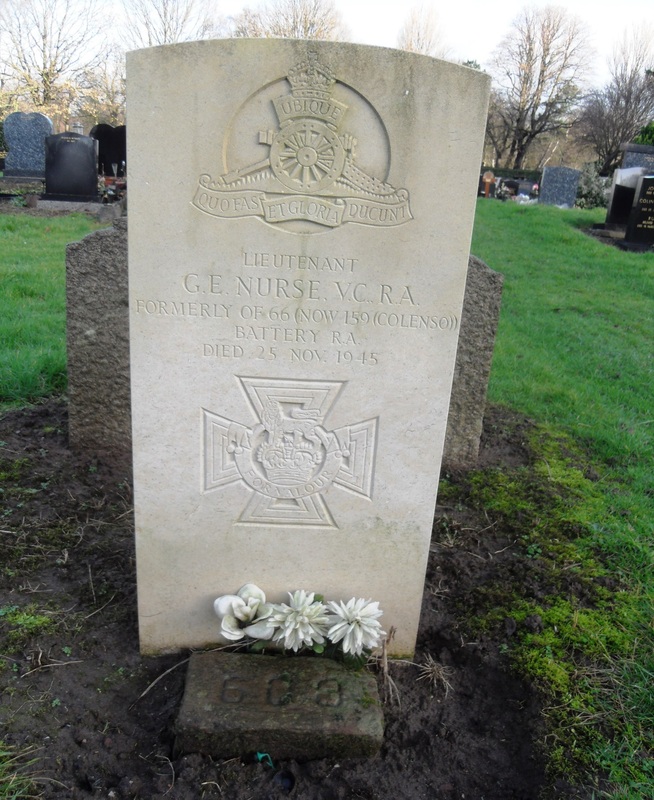 As a member of the 66th Battery, Royal Field Artillery of the British Army, he and three others made a dash across 500 yards of heavy bullet fire and shelling to replace dead, injured and fleeing comrades displaced from their guns. While Captain Walter Norris Congreve, Captain Harry Norton Schofield and Lieutenant Freddy Roberts helped harness a team of horses to a limber and line up one gun, George single-handedly limbered up a second gun. All four were awarded the VC for their bravery, Roberts posthumously. George escaped with only a minor wound to his hand. Promoted to Sergeant for his efforts, his medal was presented on 4 March 1900 by Lieutenant-General Sir G Butler at Ladysmith in South Africa. George went on to complete 22 years’ active service, ending in January 1914. But when the First World War broke out in August that same year, he quickly re-enlisted and rose to the rank of Lieutenant. Successfully surviving the hostilities, he retired to Liverpool with his wife and family in 1919. In recognition of the battle in which he won his VC, George gave his son the middle name Colenso. In later years, he worked in the Liverpool Customs House on the cleaning staff. 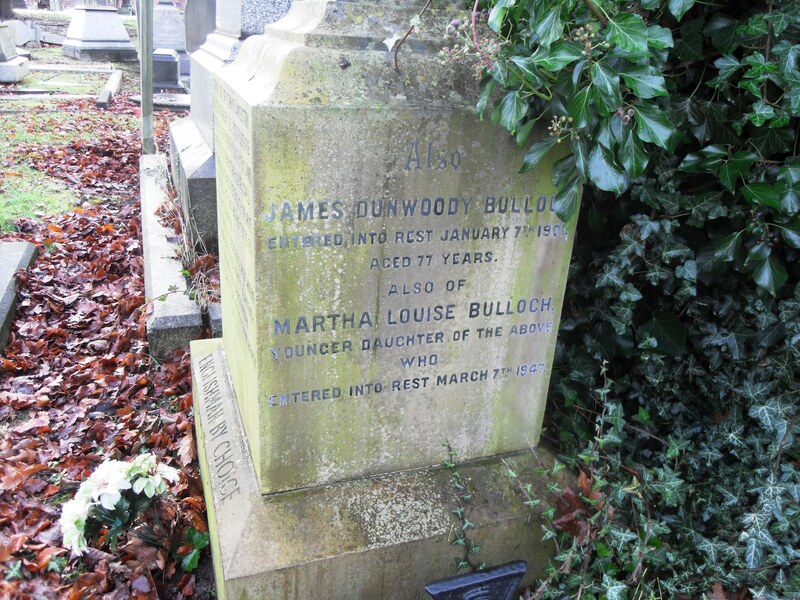 He died in Liverpool in 1945 and is buried in Allerton Cemetery. For many years, there was only a simple grave with no headstone to mark it, but a commemorative memorial headstone was erected in 1989. His Victoria Cross, along with other medals won during his distinguished military career, is on display at the Royal Artillery Museum in Woolwich, London. Liverpool’s continuing growth in the nineteenth century as a major international commercial and manufacturing centre presented a huge range of fire risks, from packed warehouses full of combustible goods to densely-packed residential areas. The city’s proud firefighting history is a testament to innovation and bravery. Up until World War II, the Liverpool Fire Brigade was part of the police force. 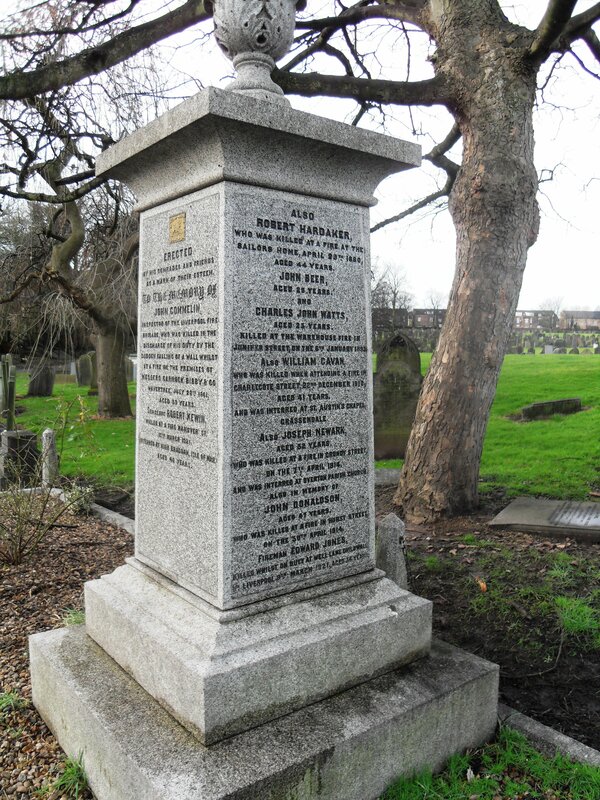 The pictured memorial within Toxteth Park Cemetery is therefore known both as the Police Monument and the Fire Brigade Memorial. Erected in 1863, it was paid for by subscription by members of the police force and others to commemorate those who died saving lives and property in fires in the performance of their duties. The princely sum of around 120 pounds was raised and the memorial was designed by a Mr Beard, the manager of the cemetery at that time. The first names to be engraved were those of Inspector John Commelin, Robert Hardaker and Richard Atkinson. Inspector John Commelin was crushed by a falling wall during a fire in 1861 at Messrs Garnock, Bibby & Co on Wavertree Road, a hemp and wire rope making factory. No other lives were lost. John left a wife and young family. PC Hardaker No: 384 was one of two men to die in a fire at the Sailors’ Home in 1860, falling 40 feet from a ladder which broke as he was ascending to break windows to fight the fire with water. The other death was of a steward at the Home. All residents were saved. PC Richard Atkinson No: 259 died in hospital after sustaining injuries when a wall fell on him at a fire in a packing case manufacturer in School Lane in 1863. No other lives were lost. Richard left a wife and three children. Further names were added to attest to the bravery of other officers killed in the line of duty over the years, the last two added for deaths in 1921. The memorial was restored and rededicated by Tony McGuirk, Merseyside’s Chief Fire Officer, in 2003. James Dunwoody Bulloch was born in 1823 in Georgia, a southern US state heavily dependent on its cotton-based economy and the slaves on its plantations. He joined the US Navy at the age of 16, but by the outbreak of the Civil War in 1861, was commanding a passenger mail ship for the Cromwell Steam Company. Asked to carry Unionist soldiers being sent to the South to crush the Confederacy rebellion, Bulloch resigned his commission and enlisted in the Confederate States Navy. Bulloch arrived in Liverpool on 4 June 1861, charged with the task of buying or building ships for the Confederate Navy to help in its struggle against the Unionists. This was a sensitive and dangerous mission as English law prohibited the supply of armed war vessels to foreign countries at war. Investigated several times for illegal activity, he managed to stay one step ahead of the authorities. He built a relationship with the shipping firm Fraser & Trenholm and worked from its offices in Rumford Place in Liverpool city centre. His role included arranging for cotton to be smuggled past the Union blockade and providing the Confederacy with its only real source of income throughout the conflict. In 1862, he commissioned the building of the CSS Alabama from John Laird Sons & Company (Cammell Laird, Birkenhead). This was used successfully for commerce raiding, attacking Union merchant ships and disrupting trade. The Confederacy collapsed in 1865, and the US authorities never forgave Bulloch for his role in the Civil War. 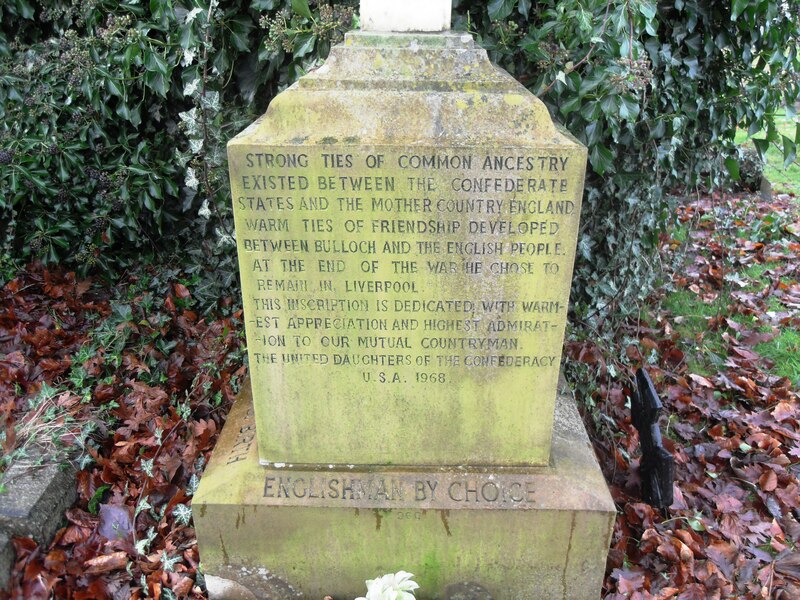 He chose to remain in Liverpool, living out his days as a successful cotton importer and broker. 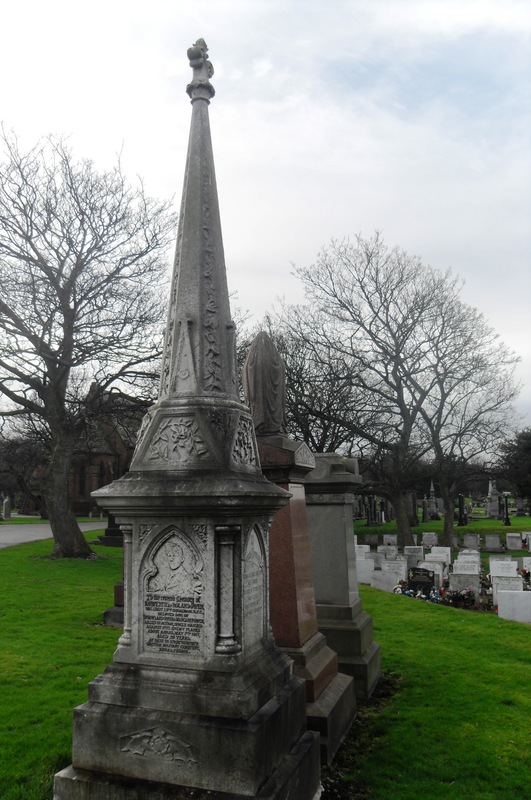 He died at his son-in-law’s home at 76 Canning Street in 1901 at the age of 77 and is buried in Toxteth Cemetery. A plaque over the entrance to the courtyard of Rumford Place bears his portrait as Agent of the CSS Alabama.